Mega Garchomp in game: 566 Who? Important notice! Pokemon Mega Garchomp is a fictional character of humans. Garchomp (Japanese: ????? Gaburias) is a dual-type Dragon/Ground pseudo-legendary Pokémon introduced in Generation IV. It evolves from Gabite starting at level 48. It is the final form of Gible. It can Mega Evolve into Mega Garchomp using the Garchompite. 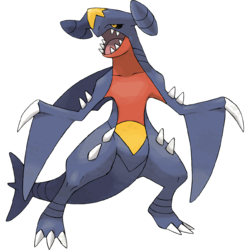 Garchomp is a bipedal, draconian Pokémon that is primarily dark blue in color. It has red on its underbelly from the lower jaw to the middle of the abdomen, including the undersides of its arms. A patch of gold comes to a point below the red on its belly, and a golden star shape adorns the tip of its snout. 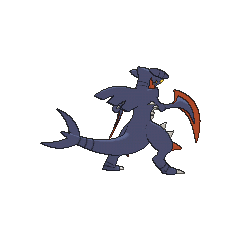 Garchomp has horn-like appendages that resemble a jet or plane's engines, giving it an appearance similar to a hammerhead shark. Its large mouth features razor-sharp teeth. The feet have three white talons, and each arm has a single large, white claw for a hand. 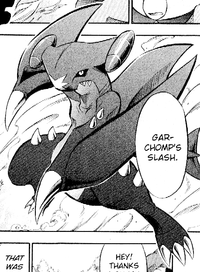 Curved fins sprout from the arms, composing wings that allow Garchomp to fly. It also has a large dorsal fin and another on its tail that resembles a shark tailfin. The male's dorsal fin has a notch on it. Pairs of small, white spikes protrude from its upper arms and legs, and there are gill-like slits on the sides of the neck. The eyes are intense, with black scleras and gold-colored irises. 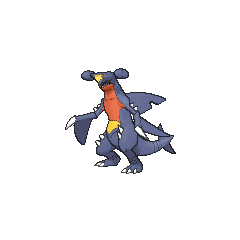 When Garchomp Mega Evolves, it grows in size and several of its features become more angular, including its head and shoulders. A row of five tooth-like spikes sprouts from each side of its abdomen, and red spikes grow from its knees. The claws and fins on its arms morph together to form sharp, red blades. 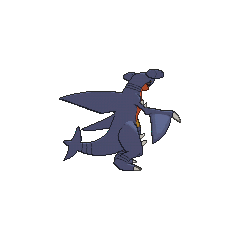 Garchomp can fly at an incredible speed—helped by the fine scales on its body that reduce drag—to catch its prey. Garchomp are cave-dwellers, and are seldom seen in the wild. 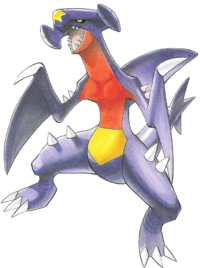 Cynthia's Garchomp made her debut appearance in Top-Down Training. She also briefly appeared in the opening of Arceus and the Jewel of Life, battling against Tower Tycoon Palmer's Milotic. Professor Sycamore owns a Garchomp that first appeared in Lumiose City Pursuit!. It was revealed in Garchomp's Mega Bond! that Sycamore has owned Garchomp since she was a Gible. A Garchomp that can Mega Evolve into Mega Garchomp appeared in Mega Evolution Special I, under the ownership of Remo. 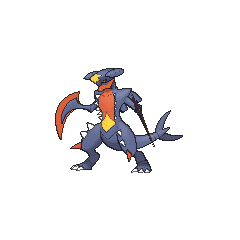 Another female Garchomp is used by one of the students of Pokémon Summer Academy in the first leg of the Pokémon Triathlon in One Team, Two Team, Red Team, Blue Team!. 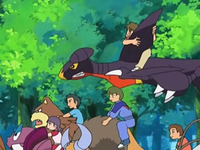 A Garchomp appeared in the opening scenes of Zoroark: Master of Illusions. DP040 Garchomp Ash's Pokédex Garchomp, the Mach Pokémon. When it folds up its body and spreads its wings, it can fly like a jet plane at the speed of sound. Cynthia's Garchomp appeared in The New World where it helped Cynthia stop Team Galactic's plans at Spear Pillar. Garchomp in Pokémon Diamond and Pearl Adventure! A Garchomp appeared in Mission Complete. A Garchomp appeared in A World Covered In Darkness. Koji was seen with a Garchomp. Like in the games, Cynthia has a Garchomp who is her signature Pokémon. 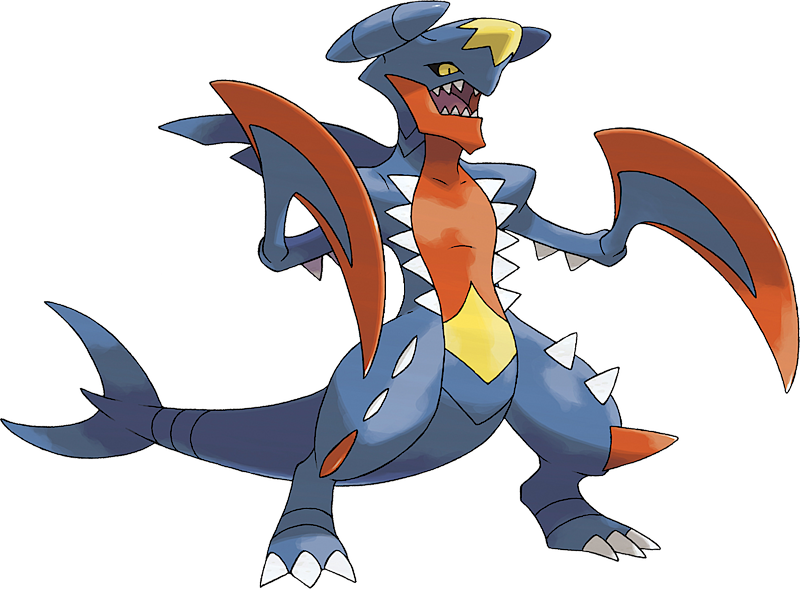 Ryu Tendo owns a Garchomp. A Garchomp appeared in PDP11. Cynthia and her Garchomp also appeared in Diamond and Pearl Adventure!, helping Hareta and his Piplup defeat B-2. It was later seen battling Mitsumi and her Infernape. Yu Shirogane owns a Garchomp. Toki owns a Garchomp nicknamed Kamaru. Garchomp appears in the background of the Kalos Pokémon League stage when the stage is in the Dragonmark Chamber. NA: Garchomp looks like a plane's engines mixed with a hammerhead shark. There's something about it that we just find so appealing - we have to get one! Garchomp is capable of folding up its body and spreading its wings, letting it move at Mach speed! Garchompite will Mega Evolve Garchomp into Mega Garchomp, increasing its power even more! PAL: There's something about Garchomp that appeals to the kid in all of us. It's basically a mach-speed flying dinosaur with spikes. What's not to love? When it folds up its body and extends its wings for flight, you might mistake it for a jet plane. And with a little Garchompite, it can Mega Evolve for extra firepower! 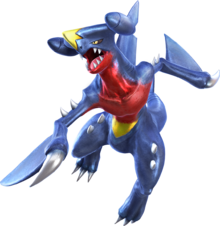 Garchomp is a Power-type playable character in Pokkén. Moves it can use include Dragon Claw, Dig, Dragon Rush, Stone Edge, Earthquake, and Sand Tomb. Upon entering Burst form, it Mega-Evolves and can use the Burst Attack Outrage Smasher. When it folds up its body and extends its wings, it looks like a jet plane. It flies at sonic speed. It flies at speeds equal to a jet fighter plane. It never allows its prey to escape. It is said that when one runs at high speed, its wings compose blades of wind that can fell nearby trees. Its body is covered in fine scales that reduce drag, enabling it to fly at high speeds. It can fly at speeds rivaling jet planes. It dives into flocks of bird Pokémon and gulps the entire flock down whole. The protuberances on its head serve as sensors. It can even detect distant prey. Excess energy melted its arms and wings, transforming them into giant scythes. Its vaunted wings become scythes, sending it mad with rage. It swings its scythes wildly and slices the ground to pieces. If this Pokémon is given a Ring Target, the effectiveness of Electric-type moves is ½×. Moves marked with a superscript game abbreviation can only be bred onto Garchomp in that game. It spits hunks of dirt to attack. It also rams at incredible speed. It charges at high speed and launches fire to attack. Garchomp came to check on the Granite Zone. He's a smash hit playing Blaziken's Boulder Bash. He came to the Crag Area to enter the Battle Tournament. He is unfriendly but can be adorable. Erases Pokémon with three lines from upper left to lower right. 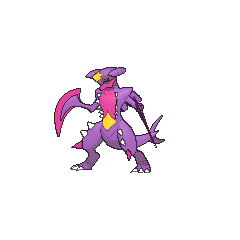 For other sprites and images, please see Garchomp images on the Bulbagarden Archives. Garchomp and its evolutionary relatives are the only pseudo-Legendary Pokémon line that do not have a base friendship of 35. Although the Garchomp in PokéPark Wii: Pikachu's Adventure and its sequel has no notch on his fin, he is referred to as male. Appearance-wise, Garchomp seems like a cross between a European dragon, various species of sharks (including the hammerhead), and possibly a dromaeosaurid or other theropod dinosaur. Its design also strongly resembles a jet aircraft. 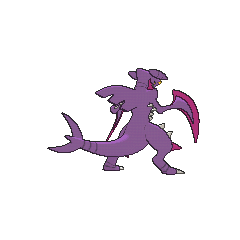 Garchomp may be a combination and corruption of gore (a projecting point), guard or Carcharodon (the scientific name for sharks) and chomp. Gar may also derive from garpike (a species of fish somewhat similar in appearance), gargantuan (relating to its size) or gargoyle which occasionally bears a likeness to European dragons. Gaburias may be a combination of ???? gabugabu (onomatopoeia for gulping) or ???? gaburito (bite or chew) and ?—? asu (earth) or Carcharias. Mandarin Chinese ???? / ???? Lièyaolùsha Literally "Violent biting land shark"